Steel and aluminum boatbuilding. See: "Boatbuilding Methods", in left-hand column of the Home page, for information about alloys. Charles, for the motor issue just disconnecting the battery if everything is grounded back thru it will be sufficent. Use the method I emailed you for the gas and you can actually weld on the tank with no issues. Thank You for the reply as far as the tunnel, just wish I had a couple grand to put into aluminum and get started! Just might have to start picking away at it! 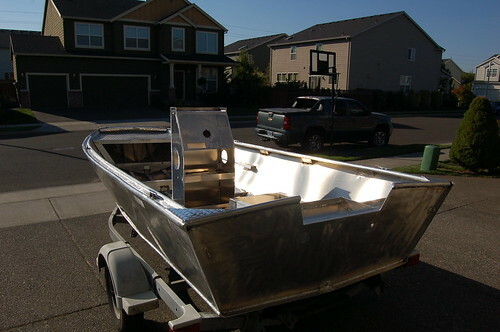 Like many have already said, "it is great to see a metal boat build here on the forum". I wish we could find good plans for metal boats "without welding". It would be nice to build a boat with "rivets". 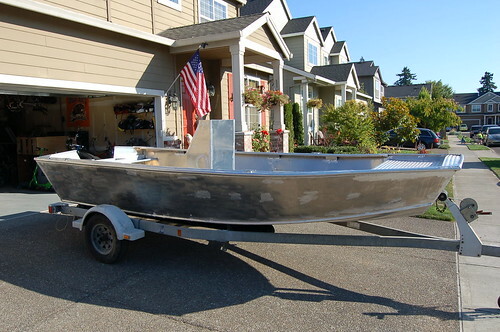 I know there are many commercial made metal boats are built this way, but I have not seen any plan/kit boats. I am sure there are many airplane builders out their with the skills to rivet and maybe interested in a new project that does not cost as much as building another airplane. 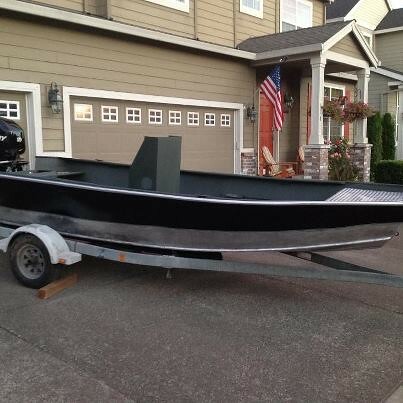 Really nice job on your boat. Your Scrambler looks GREAT! I've been using mine all summer and now that the kids are back in school I’m getting ready to paint my interior this fall before the Steelhead start to run. Our local river boat builders use a paint called ZOLATONE for interior finish. I just ordered a gallon of Zolatone 20 in Medusa Gray to do my interior. This paint sprays on thick do to the paint flakes that are part of the . It holds up well and has a multi-color look to it that helps hide dirt, blood and welds (I need it to hide my welds). Here are some Scrambler pic's with downriggers. I mounted them in my oar locks for quick removal. New Hydraulic jack plate installed. I can run in 8" of water with the prop. Still have the jet pump just in case. Fishing with the kids. Never too early to start them. Love your pics, thanks for sharing. Boat looks good on the water. Hydro lift for motor, high tech... Nothing like catching fish from the boat you made and the memory made with children. Good times. Thanks for the connection on the Zolatone 20. I found on the link a distributor just a few miles from me. Going to go with Jungle Green for the inside of my boat. Pick up tomorrow and get her painted. 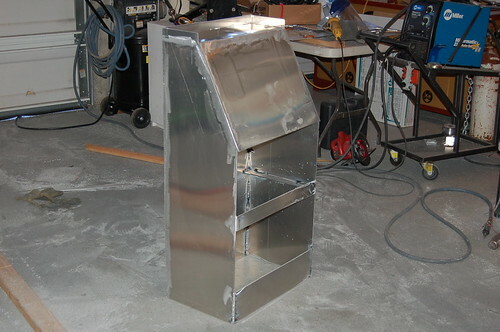 Love the idea to cover some of the beginner welds too! Will go with a gloss black on outside. 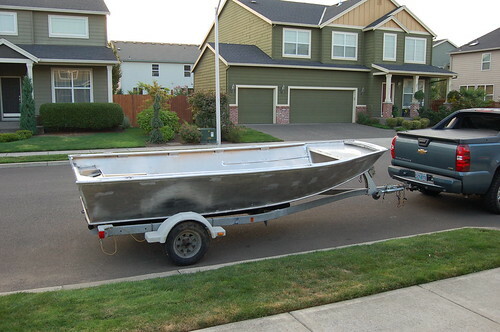 All the guy's in my neighborhood stop by to check out the boat. It has been fun getting to know them. Really looking forward to getting on the water and having fish on!! Maiden Voyage a few days ago. This was today. Thanks for all the help and suggestions. 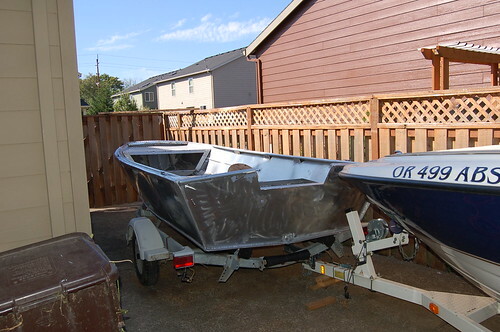 I learned a lot..
A couple of aluminum boats you must both be proud of..and no worrying about them coming apart ! cbrammer wrote: After waiting for info on my transverse side frame question I decided to get moving on this project again. Here are a few photos of where I’m at today (just finished up for the night). I ran the welder a little too hot and blew a few small holes in the bow. I'm going to fill them in later and buff out the entire hull to help blend in some of these issues. I'm going to start laying up bottom plating next. I will keep this tread going for updates as I progress..
Hi CBrammer is it possible for you to upload a video to youtube I cant find video of a scrambler in action on the water. Thank you. cbrammer has not been active on the forum for about 3 years. Sorry. I know this is an old thread, but was hoping I could get some help. How did you know where to set the height on the Pram Bow piece? I dont see any dimensions on any of the drawings I have. I might just be missing something but am a bit lost right now. Also I see both of these boats have the side frames missing on some of the middle frame sections. Did you cut them out once you put the sides on or just omit them all together? I don't have the plans, so I'm just shooting in the dark- what I'd expect to be the case in reply to your question. In the Profile View, the boat is either being built keel down or keel up (?) and in either case- there is some form of strong back (?) which I'd say located the keel in the after sections of the boat. I'd lay a line on the keel- extending it forward under the bow panel and then scale the distance up- or down from the lines drawing. This is a planing hull so it stands to reason the keel (and buttocks) are straight lines aft the midsection/master section. Using that premise then, a line forward as an extension of the keel, drawn on the plans page should give a reference for the both the angle (bow stem rake forward) and the distance above the extended keel? Just my take- I many not completely understand your question but this is what I'd expect of a Profile View set of scaled lines. eurof2, I should have read more thoroughly, instead I'll post again in an attempt to reply to your framing questions. First, not seeing the actual plans- I'll remark in general about metal skiff side frames- transverse frames up the topsides from the chines. Their main purpose in life is two fold - one is to help hold the topsides' angle (flam) to the bottom panels at the chine during tack-up and the second is to (become) part of the permanent welded frame of the boat- when connected to both the longs and the topsides panel by welding. As to the first- if you're not keeping the frames in the permanent structure (we'll address that in below) then; just tacking the topsides or upper frame pieces to the bottom or main transverse is adequate for the first purpose- you don't have to weld the chine joint of a bottom and side frame solid- just to use the upper portion for tack up purposes. As to the finished framing - there are options that will result in just as stiff a frame in welded metal boats: that is a guard deck and "knees" or struts between the inner guard deck and the topsides. Let's take a quick (verbal) look at the forces on the topsides. As the boat is filled with more and more wt/displacement increases/sits deeper in the water- the force trying to fold the topsides in is greater the deeper the boat is in the water. This is due to the long lever of the side ("pivoting" at the chine) and the increased force downward of the added wt in the hull (requiring more buoyancy). So; the topsides can resist this inward force by having side frames with some longitudinal shapes all welded into a long curved honey comb of framing combing the topsides with the interior framing. Or by having some other frame structure to support the topsides and resist the inward force. Another force on the topsides is impact force. When the boat is moving fast and hits the water hard- the force upward on the keel and bottom tries to make the sheer or gunwale GO Wider. This means that side ribs and longitudinals could also be considered as holding TENsion on the sides. A force that is sometimes overlooked in considering the roll of side ribs as part of transverse framing. However, another means of resisting both those sets of forces can be used in welded metal boats. This is to put a guard deck of several inches width or a very large extrusion along the topsides at the sheer. Sometimes called a sheer clamp (from wood boat framing terminology) others call this mostly horizontal plate a guard deck and still others a gunwale plate. Whatever we call it the resulting contribution to boat strength is still very high. The plate is oriented to be the strongest on edge- that is it resists the forces inward and outward on its strongest axis. All the main forces have to bend/tear/distort/unweld this plate on edge. If it can be kept in "plane" or kept so the two edges are intact- not torn, wrinkled, cracked or distorted- this single plate is more than enough to keep the entire boat in its designed shape. Several ways to keep this shape are: #1 weld it continuously to the topsides upper edge (sheer) #2 weld it to an extrusion that is welded to the topsides sheer; #3 weld an interior extrusion to the inner edge while using legs, struts, knees to attach the sheer clamp/guard deck/gunwale plate to the topsides. In fact, when completed the struts and added extrusions form a triangular box beam of incredible stiffness- while remaining light wt. So, the side frames are only one way of building and once they do their job as formers- for tack up- they can be skipped in the weld out- and then removed IF a gunwale plate is added as shown by some of the pictures above. Hope this helps? and answers your questions about the side frames.